Music video for "I Go To Extremes." © 1989 Sony BMG Music Entertainment. Until the heart in you is starting to break?" He is both "eager to please" and then also "ready to fight" and does not know why he goes to these extremes. Yet he tries to reassure his partner too: "You can be sure when I'm gone, I won't be out there too long." Like most songs on Storm Front, it has an infectious melody and a strong beat, but is a bit over the top in production. 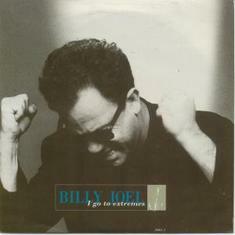 The recording is somewhat bombastic, yet is one of the most fun Billy Joel songs to sing at karaoke or on Rock Band. ​ The music video for the song is also fun to watch albeit the part where Billy plays piano with his foot at the end seems gratuitous. While he was recording the song, Billy broke some piano keys because he was pounding the keys so hard, and when the video producer heard about this, she wanted to capture this on the video. You can see the broken keys toward the end of the piano. The video is reminiscent of U2's videos for "The Fly" and "Mysterious Ways." If U2 were to do a cover of a Billy Joel song it should be this, "No Man's Land," "She's Right On Time," or "Blonde Over Blue." Unfortunately, however, the only recorded cover of this song is Paul Anka's bizarre Las Vegas style version. ​ "I Go To Extremes" was the second single off Storm Front and reached #7 on the chartsin 1990. Many years later, actress and fellow Long Islander Lindsay Lohan tatooed the lyrics "clear as a crystal, sharp as a knife/I feel like I’m in the prime of my life" on her side. See article. Billy on "I Go To Extremes," from SiriusXM. "I Go To Extremes" from Live at Yankee Stadium (1990).